Home » Hairloss Restoration for Men » NuNutrients Advanced Hair Re-growth Treatment for Men » NuNutrients Advanced Hair Regrowth Treatment for Men – A Complete Review from Results! NuNutrients Advanced Hair Regrowth Treatment for Men – A Complete Review from Results! The NuNutrients Advanced Hair Growth Treatment seems to be only available for men, and not for women on Amazon website. The hair is one aesthetic feature of the body and as such everyone would want to have it look fuller, stronger and healthier. In addition to heredity, age and medications that impacts the hair negatively, Dihydrotestosterone (DHT) is known to largely impact the hair. For a fact, a good number of products have been proven to improve the health and appearance of our hair by either counteracting effect of drugs, age and/or DHT. In my research for hair supplements that works, I cut across NuNutrients Advanced Hair Re-growth Treatment for Men and it claims to counteract the negative effects of DHT. It is marketed on the manufacturer’s official website and it is also available in other retail websites. How does this formula work? What shows that it will leave up to its claims and promises? This review is designed to highlight and evaluate the information about this product called (NuNutrient Advanced Hair Re-Growth Treatment). This will help us as prospective users make informed decisions. NuNutrients is marketed as an advanced hair re-growth and hair treatment serum for men, the women’s version seems to be no longer available. 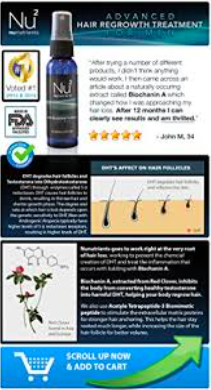 This product is made by a U.S based company who claims that NuNutrients Advanced Hair Re-growth Treatment is designed to counteract the negative effects of Dihydrotestosterone (DHT); a metabolite that causes hair loss. The serum, according to them should enhance the re-growth of lost hair and address the problem of balding. NuNutrients is said to be made with potent ingredients in an FDA approved U.S facility. This product is available in a spray bottle (2fl oz). Each bottle should last for three (3) months. How Do We Use this Product? 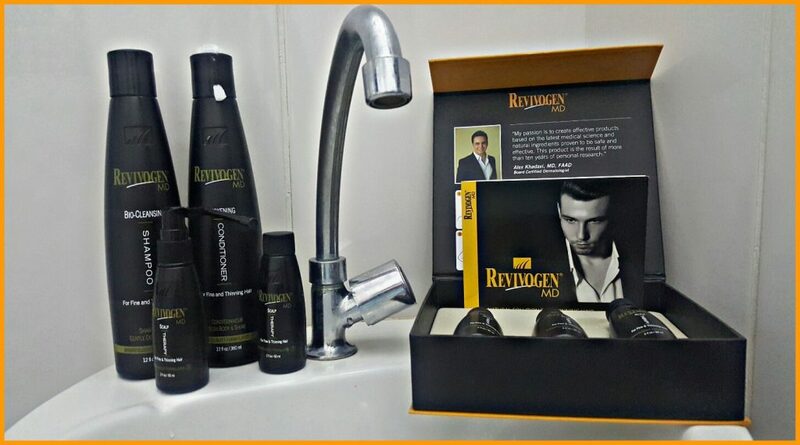 As described by the manufacturer, the serum is designed to be sprayed directly into the scalp. Also, they mentioned that we can spray this hair serum in our hands and rub it into the part of the scalp affected. Additionally, I could find a good number of previous users of this product (NuNutrients Advanced Hair Re-growth Treatment for Men) who gave positive feedbacks about it. There are some negative feedbacks as well, especially by folks who have a receding hairline. NuNutrients Advanced Hair Re-growth Treatment promotes to contain a combination of potent ingredients designed to address problems of hair loss and balding. These should include Biochanin A, Acetyle Tetrapeptide-3, Purified Water (Aqua), Butylene Glycol, Dextran, Acetyl Tetrapeptide-3,Trifolium Pratense (Clover) Flower Extract, Dimethicone, Dimethiconol, Laureth-4, Laureth-23, Sodium Cocoyl Amino Acids, Potassium,Dimethicone PEG-7, Panthenyl Phosphate, PPG-26 Buteth 26, PEG-40 Hydrogenated Castor Oil, Apeginin, Oleanolic Acid, Biotinoyl, Tripeptide-1, Phenoxyethanol, Ethylhexylglycerin. According to the manufacturer, NuNutrients Advanced Hair Re-growth Treatment for men addresses hair loss from the root. It is said to prevent the accumulation of dihydroxytestosterone (DHT) in the hair follicles. 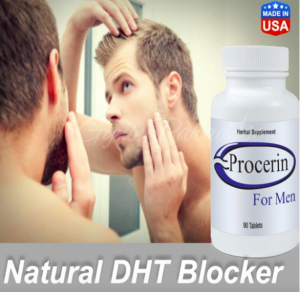 Apart from reducing the conversion of testosterone to dihydroxytestoterone, this product is claimed to modulate free radical damage to the skin and the scalp. This hair serum contains Acetyle Tetrapeptide-3 Biomimetic peptide. With reference to the manufacturer’s description, this component should stimulate the extracellular matrix proteins which in turn increase the hair anchoring. 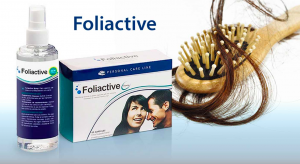 Additionally, NuNutrients manufacturer said to reduce the inflammation typical with thinning hair and/or balding. 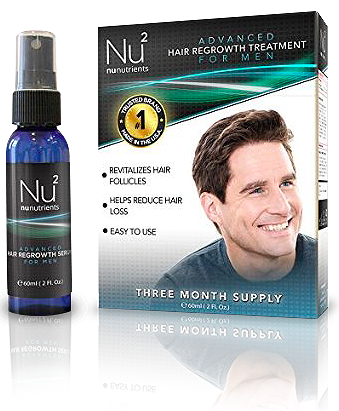 NuNutrients company promotes this NuNutrients Advanced Hair Re-growth Treatment is for men who are experiencing hair loss, thinning hair and baldness. Similarly, it is said to work for folks who want to achieve a healthy hair growth with more hair volume. NuNutrient promotes to contain potent and scalp compatible ingredients that are devoid of side effects. This is to say that individuals who want to avoid the side effects of taking pills for hair loss will find this product beneficial. It is not to be used to diagnose, treat, prevent or cure any disease or existing ailment. Results may vary from one person to another. NuNutrients Advanced Hair Re-growth Treatment for Men is said to be an advanced hair serum product with potent ingredients, hence should not impact the user’s body (scalp) negatively. From our information source, orders for this product are delivered within 5-10 business days. The manufacturer states to accept returns for defective products only. What if we are not satisfied using the product? The manufacturer’s description of the product implies that it is not backed by any refund policy. Having gone through the various details about NuNutrients Advanced Hair Re-growth Treatment for Men, can we at this point infer that the product will achieve its claims and promises? Yes, we are close to a point to make our inferences, but not without revisiting some salient information about this hair serum. Firstly, NuNutrients manufacturers did not base their claims on any evidence. In paraphrase, the claims should be backed up by real proofs (clinical or scientific proofs), right!? Similarly, they seem not to offer refunds for this product. This also means lack of confidence. Yes, there are a good number of positive feedbacks about NuNutrient, what if they are falsified? Evidently, I could see that in some of the feedbacks the customers said that it does not work especially, for receding hairline, but other than that, several users on Amazon reviews are saying that it’s working for new hairs. At this point, I can tell us that this hair serum could work as a good hair re-growth serum which as it claims. Real proofs from the company’s background for the effectiveness is questionable, but again, there are several users out to share their results. Remember to leave me your concerns while we respond to you faster than you expect! Previous Post ATS 64 Diodes Laser Cap Review – Is This a Proven Laser Helmet To Work Effectively? See Details Here! Next Post Hairfluence Review – Will these Pills Grow The Hair Naturally As Claimed? Read Reviews or Side Effects! ?